This world class competition highlights the strategic challenges and managerial dilemmas faced by global business leaders. Competing teams from premier business schools work under pressure to solve a real business problem, using simulated business conditions such as time-critical deadlines and incomplete information, to formulate workable, action-oriented recommendations. Participation in the Marshall International Case Competition is both an honor and a supreme challenge. 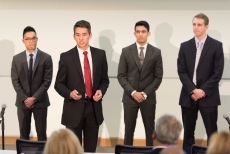 Solving real World Business problems under the stressful conditions and strict deadline requirements of the competition is a test of each individual's creativity and problem-solving abilities. These students, tomorrow's business leaders, will be better prepared to meet the challenges of a rapidly changing global business environment.